Before I started working in Durham, folks told me that Durham was different. I thought, how different can it be? I lived and worked in Raleigh for over nine years. Durham is just 30 minutes away. I really didn't understand the sentiment. Having worked at StepUp Durham now for six months, I see that Durham isdifferent. Some things you can put your finger on; others are less tangible. A "Durhamite" recently told me something that helped to articulate this difference. As a person who had lived in all three cities in the Triangle--Raleigh, Chapel Hill, and now Durham--she has this to say: In Raleigh, it is about who you know. In Chapel Hill, it is about where you went to school. In Durham, it is about what activates you. The fact that Durham is not "too big" and not "too small." It's just the right size to feel the energy that is everywhere. Our new Walltown friends, especially CD, who sits on his porch on a nice day greeting folks with a wave and smile. The Empty Bowls fundraiser at Urban Ministries of Durham – There are so many elements that make this dinner the BEST EVENT EVER! Black Wall Street – As a woman of color, I feel empowered being in a place with a strong black history. The collaborative spirt that radiates from agencies, churches, and people who believe in collective impact. The hospitality felt from the owner of Beyu Caffe, Dorian Bolden, and his team when I walk in the door. Our partner Dress for Success’s public sale. A name brand suit for $20. What??! The fact that my team lets me speak in verbal emojies whenever possible. 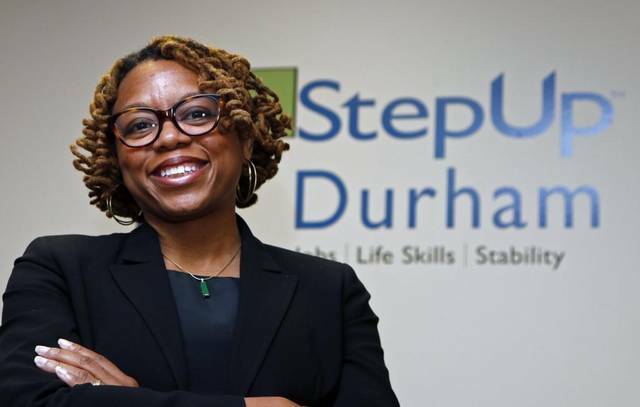 Syretta Hill has served as StepUp Durham's Executor Director since September of 2015. Prior to serving at StepUp, she worked for seven years as a community organizer and neighborhood relations director for Habitat for Humanity of Wake County. She also served as a workforce development trainer for a local school district and the director of operations at a small publishing company while living in Philadelphia. The daughter of parents who worked in the prison system, Syretta became passionate about StepUp Durham's mission to walk alongside people facing barriers to employment (including a criminal background), as well as the organization's emphasis on community listening and racial equity. Syretta holds a M.A. in Education from Temple University and a B.A. in Communication from the University of South Florida. She is a mother of two and has been married for 17 years.